AMUWO, ‘Kunle. Introduction. Transition as Democratic Regression In: Nigeria during the Abacha Years (1993-1998): The Domestic and International Politics of Democratization [online]. Ibadan: IFRA-Nigeria, 2001 (generated 22 avril 2019). Available on the Internet: <http://books.openedition.org/ifra/632>. ISBN: 9791092312089. DOI: 10.4000/books.ifra.632. AMUWO, ‘Kunle (ed.) ; BACH, Daniel C. (ed.) ; and LEBEAU, Yann (ed.). 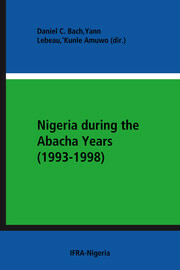 Nigeria during the Abacha Years (1993-1998): The Domestic and International Politics of Democratization. New edition [online]. Ibadan: IFRA-Nigeria, 2001 (generated 22 avril 2019). Available on the Internet: <http://books.openedition.org/ifra/623>. ISBN: 9791092312089. DOI: 10.4000/books.ifra.623.